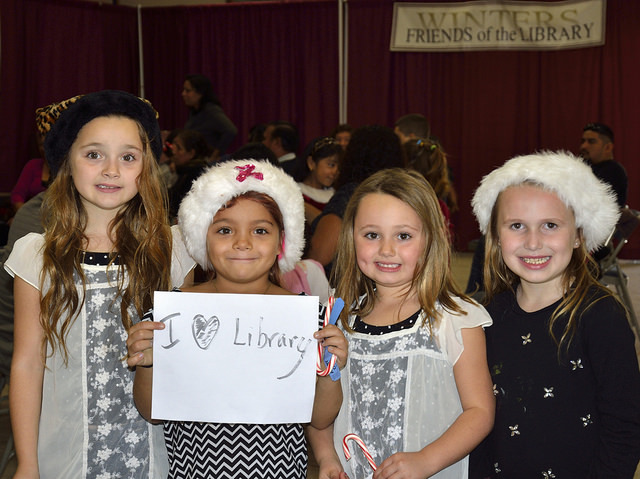 The community is invited to a warm Winters opening to the holiday season when Winters Friends of the Library (WFoL) presents their annual Family Holiday Festival on Saturday, December 5, from 10 AM to 2 PM in the Winters Community Center. Admission is free. Preschoolers will be singing with Katie Henry to open the event at 10- 10:30 AM, followed by family crafts, food, and book fairs for adults and children. At 11:30 AM, Waggoner students grades K-3 will sing. At 12:30 Shirley Rominger students will take the stage. Winters Middle School musicians will take the stage at 1:30PM. Between our children’s singing, there will be family crafts to make, face painting, delicious homemade soup, sandwiches and cookies for sale, holiday book fairs for children and adults, photos with Santa, handmade crafts to purchase, and more. This year, craft making and singing will be at different times, so parents and families will not have to struggle to hear their little ones perform. Katie Henry leading the family sing along. Katie Henry will sing at the festival with our children, thanks to a generous donation from WFoL, which has sponsored folksinger and music educator Katie Henry to work with preschoolers at Winters Preschool and at Winters Parent Nursery School to prepare for our event. Katie is working weekly with 3 preschools for 4 weeks leading up to the festival. Parents are invited to sing with their toddlers and with Katie. Following each set of singers, Santa Claus will be available for photos and to speak with children. In Mrs. Claus’ Kitchen, there will be delicious treats to buy. Randy Oates will be making excellent gourmet sandwiches, Carol Scianna will contribute her famous minestrone soup, and there will be amazing home-baked cookies to round out the meal. 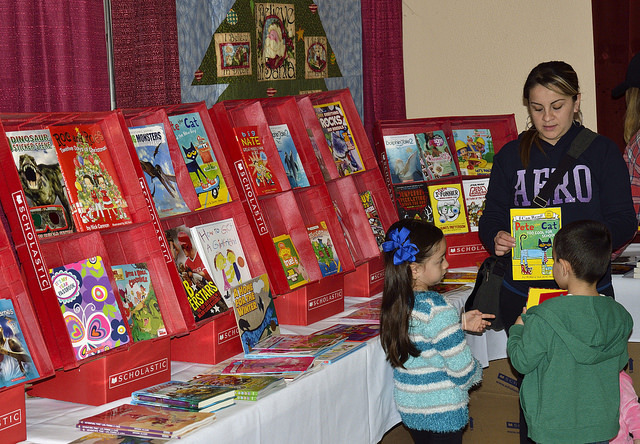 High quality books for preschool and primary students will be the focus of the Family Holiday Festival Scholastic Book Fair. Many of the books from Scholastic are good quality paperback editions of the best picture books and youth titles of the year, and are modestly priced. 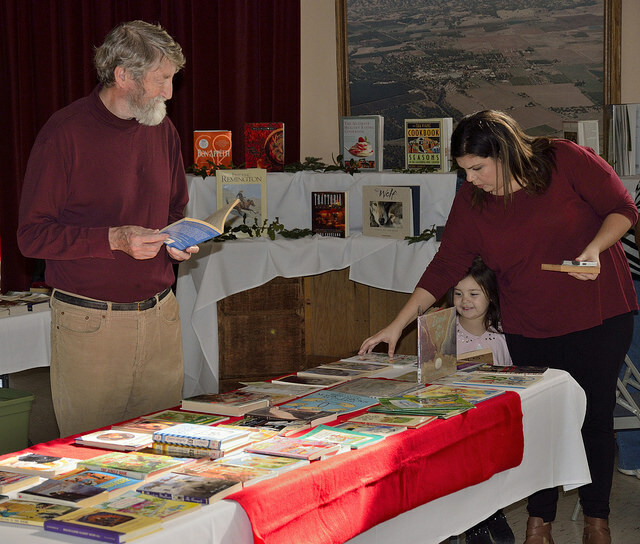 Adults will also be able to shop for gently used gift quality books sorted by Richard Cowen and Karla Knabke from the donations many Winters residents make to the Winters Library second hand book store. Family crafts this year will include fragrant beeswax candle rolling, tin trivet making, holiday card and paper crafts, ornament making and more. All crafts will cost between 50 cents and $2 to make and take home. Community groups, such as the Fortnightly Club, and the High School Art students, will offer homemade items for sale. Finally, the walls of the community center will be decorated with beautiful handmade quilts by talented local quilters. Please plan to attend the wonderful community event on Saturday, December 5, 2015 from 10 am to 2 pm. If you would like to volunteer to help at the event, please email volunteer @wfol.org.